Hey readers! I'm here in my hotel room in Novi, Michigan getting ready for the American Sewing Expo (and having a slumber party with Sunni of A Fashionable Stitch!). 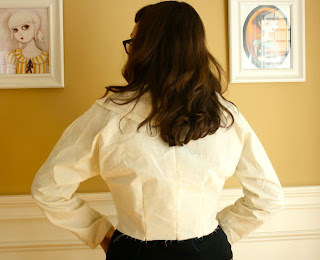 But I wanted to put up these pictures of my muslin for our Butterick 5824 Sew-Along. For your reference, this is a size 14 made without any fitting adjustments. Overall, I'm happy with the fit! I also thread-traced over my center front line and my buttonholes so I knew where to pin my overlap in place--the center front lines should match when worn. 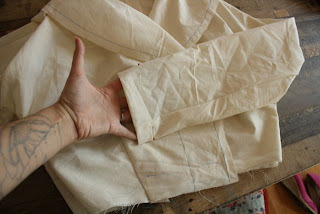 Also, pin up your sleeves 1-1/2" to account for the hem allowance. When you try on your muslin, wear the same amount of layers you usually wear in the cooler weather. In my case, a long sleeved sweater. One thing to remember with this pattern: the skirt on this coat is really heavy, so it will be putting weight on the bodice. (Some participants have reported the bust darts ending too high, and the lack of skirt weight at this point could be the reason.) You may want to pull down slightly on the bodice to get an idea of how it will look when you're wearing it. You also may notice some pull marks under the arms. 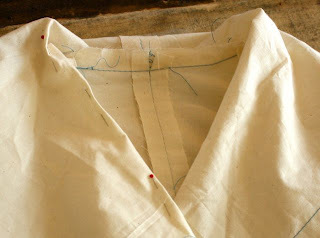 The kimono sleeves cause this, and without a gusset to shape them, there's not a whole lot to do about it--since you want the sleeve to have plenty of ease to allow for clothing underneath. 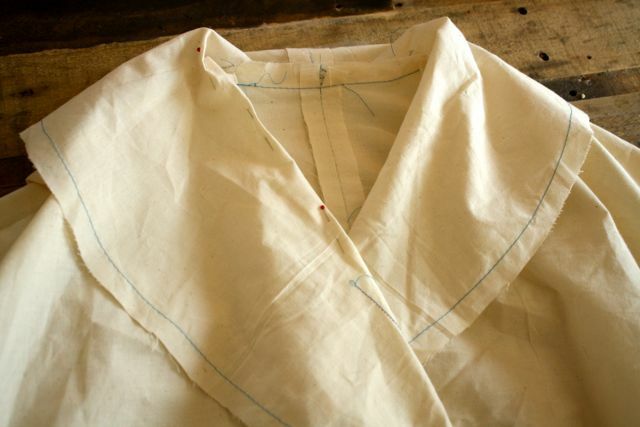 Also, remember that your fashion fabric will add some structure to the entire garment. Make sure that you have enough room to place a few fingers between your body and the waist of the muslin. While you have your muslin on, it's a good idea to mark your roll line--the place where the collar creases on your body. (You only have to do one side.) Pin the roll line in place for future reference. 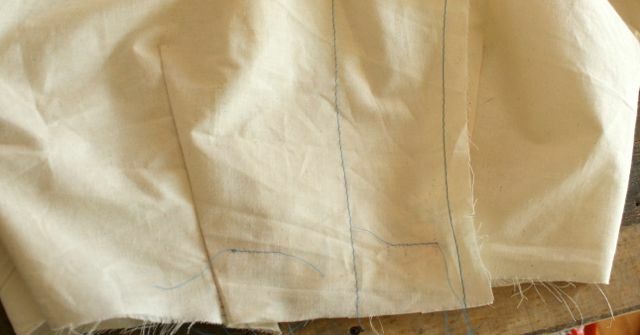 This will help us with our fusible tailoring in upcoming steps. I got Rosie to hop into a picture! How is your fitting going, readers? what a great muslin! Although there are some fitting issues (which I hope to help with), I think it's a great place to start and your suggestions are on point. Have fun at Novi! I briefly considered going for Clair Shaeffer's class and I would have loved to see you, too and meet Sunni! and everyone there. BUT.... I really don't have enough vacation time to go traipsing off every time the spirit moves me. Your muslin looks really good. You know what I'd love to do with a pattern like that would be to come up with a gusset for the underarm. Just because I like gussets. Terrific! I love the collar. I'm so glad you posted. It seems everyone is having issues with too much fabric across the back and in the underarm area. I am very interested to see how you adjust that. I am going to cut out my muslin today. There are lots of pics on Twitter of back issues. I wish I could sew along on this project! In Florida I can't imagine I would have an excuse to wear a large coat like this though... What would this look like, I wonder, in a lighter fabric?? Maybe even rain style? Too much structure? After Halloween costume time I want to try it! I can't wait to start this! I ordered my pattern almost 3 weeks ago now and it still hasn't come. Maybe it'll be better that I'm a little behind so that I have lot's of stuff to read from everyone else. ;) Looks good though! Can't wait to see the finished product! Just to clarify, this pattern is Butterick sizing/grading, not the same from your book where I'm a perfect 16, right? Nope! It's Butterick's usual sizing system. I was just wondering the same thing? Might not the weight of the shirt also pull the excess fabric down throughout the back? 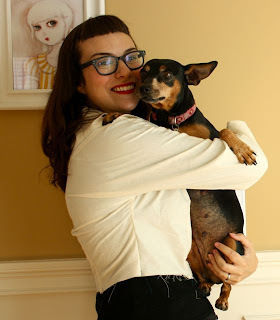 Thanks so much for this post Gertie! You touched upon all of the issues & thoughts I was having with this pattern. It's so nice to see the muslin made by the person who actually designed the pattern, because honestly so many of us are having issues with the fit, not only the back, but baggines at the underarm/side bust. 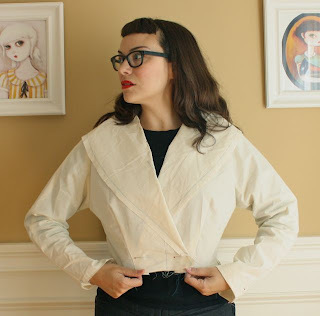 I for one have never sewn or worn a dolman/kimono sleeve before, and figuring out all the issues of ease in the high bust is driving me batty. I hope you will address the issue of FBA's and whether this style of pattern needs one (I did a 3" FBA and after seeing your muslin I'm not sure if I just went too far!) I'm going to hold off on doing anything more until we see your final muslin, or at least someone else with a larger cup size posts muslin pictures and joins the discussion on flickr. Thanks for the great pics, they really help! I'm having some issues with fitting the upper back -- the back collar and the dart doesn't line up? Love the muslin! Man I wish I had the time to make a coat..I got a poor little old Anne Klein coat that needs my love and get a new lining! BTW My daughter (who's 5)loooves the pics with you and your doggie! I wonder: is there a way to replace the kimono-sleeves with normal ones? And I agree with Jen and Sherry: looks like you need the extra fabric in the back for movement and dog-cuddling ;-) I would really hate to have a "straight-jacket" effect!! That is so cute. I want one. Very flattering too. Can you advise how the sleeves, that appear horribly twisted in the first photo, will work in an expensive fabric. I guess as you are "happy with the fit" that you haven't noticed just how bad the fit is. Hi there! Could you please, going forward, try to phrase your criticism in a more constructive tone? I would appreciate that--we all have much to learn from each other! I apologise. I should have simply asked - "Can you please advise how the sleeves, that appear twisted in the first photo, will work in an expensive fabric?" In my experience, what we are seeing in the first mulin photo is *Drape* not Twist...because the upper sleeve seam is where it is supposed to be. And as can be seen in the Dior Fashion Photos, sleeve drape is an *intended* result of a Dolman/Kimono sleeve draft. Also, let's not forget that a sleeve made in muslin will not have the eleganr folds of the same sleeve rendered in lovely fashion fabric. 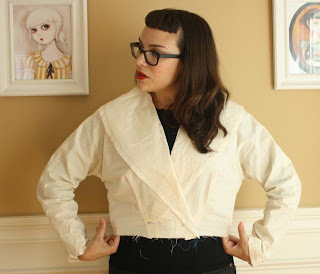 let's make that..."what we are seeing in the first MUSLIN photo...."
The muslin looks adorable on you! Now I am even more excited for the sew-along.